These B-G Racing Mid-Rise Vehicle Ramps are ideal for multiple applications. The ramps have 110mm of lift for quick under-body maintenance tasks. They also provide enough clearance to enable trolley jacks to safely access the lifting points of lowered vehicles. The gentle gradient makes them suitable for use on most lowered vehicles, kitcars, sportscars, rally cars and racecars. 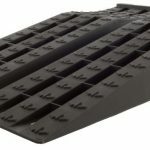 These ramps are produced from a durable black polypropylene (PP) and have a combined weight loading capacity of 5000kg (11000lb) as a pair. They are priced at £83.99 inc VAT. For more details visit 01268 764 411 or visit www.bg-racing.co.uk ENDS. Print article This entry was posted by admin on November 2, 2018 at 10:25 am, and is filed under News. Follow any responses to this post through RSS 2.0. Both comments and pings are currently closed.